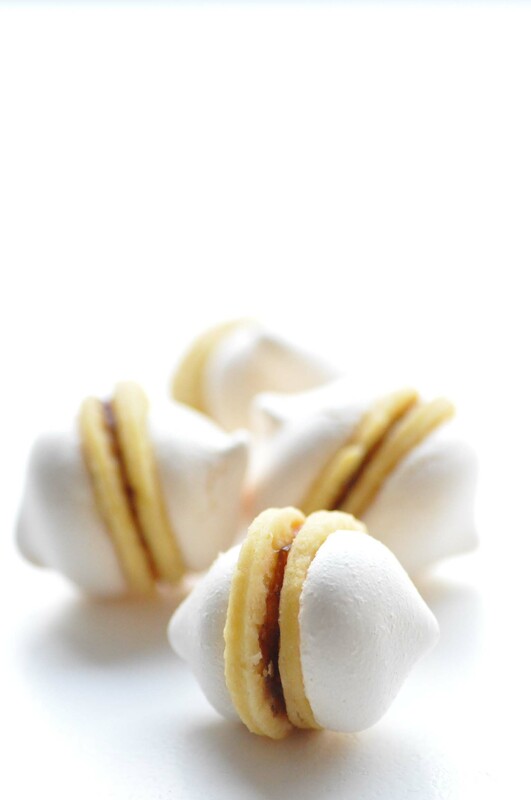 friends, these austrian apricot jam meringue cookies are extraordinarily delicious and pretty! you need a bit of passion to prepare them, but it is absolutely worth the effort. believe me! so if you want to offer them as a christmas present to your beloved, i strongly recommend to double the amount, as it is very hard to retain from eating them by yourself and they are one of those cookies you never have enough of. such as the lavender cookies of last week, this treasure is from das kleine keksbuch. and i think, they are my personal season’s highlight this year. so enjoy baking them and your second sunday of advent! combine the sifted flour and soft butter and add the egg yolks. mix until it forms a ball. wrap your dough in some cling film and allow to rest in the fridge for halve an hour. roll out the dough and cut out the cookies with a round cookie cutter. if you don’t have one, it will work also with a small glass. place the cookies on a baking tray, lined out with baking paper. beat the egg whites until stiff and add the sugar little by little while beating. 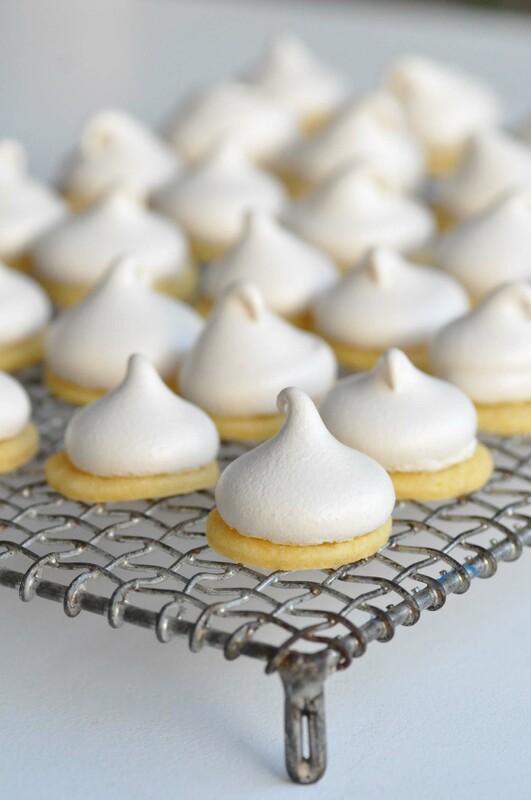 fill the stiff egg white in a pastry/icing bag and top each cookie with a little beaten egg white peak. bake for 30 minutes. the egg white should stay white. allow the baked cookies to cool down completely. finally you can stick them together, taking always two of the cookies with some apricot jam in between. the jam needs some hours to dry a bit, so let the cookies on a cooling wrack for a while before storing them in a box. but be careful, they are really sensitive and break easily. so maybe the best idea is just eating them immediately. das gesiebte mehl und die weiche butter miteinander vermischen und dann die eigelb dazugeben. gut miteinander verkneten und zu einem ball formen. den teig in frischhaltefolie wickeln und eine halbe stunde im kühlschrank ruhen lassen. den teig ausrollen und mit einem runden keksausstecher ausstechen. wer keinen runden keksausstecher hat, kann auch einfach ein kleines glas nehmen. die ausgestochenen kekse auf ein mit backpapier ausgelegtes backblech legen. die eiweiße steif schlagen und peu à peu den zucker einriegeln lassen. das steif geschlagene eiweiß in eine spritztülle füllen und auf jeden keks eine kleine eiweißspitze aufspritzen. die kekse für 30 minuten backen. die eiweißspitzen sollten allerdings weiß bleiben. die gebackenen kekse komplett auskühlen lassen. und dann jeweils zwei kekse mit einem klecks marmelade zusammenkleben. vielleicht ist es doch die beste Idee, sie einfach gleich zu essen. die marmelade braucht eine weile um zu trocknen, also die zusammengeklebten kekse besser eine weile auf dem kuchengitter liegen lassen, bevor sie in schachteln gelagert werden können. allerdings ist absolute vorsicht geboten, da die kekse sehr leicht kaputt brechen können. viel spaß beim backen und einen schönen dritten advent! This entry was posted in recipes, winter and tagged apricot, sweets by The Cook. Bookmark the permalink. My cousin found this recipe and mailed it to me. By the way she lives in Canada I in the USA. I’m so looking forward to baking these cookies. Thank you very much. My mother used to bake these every Christmas. They are wonderful…. Yes, they are wonderful 🙂 Enjoy!